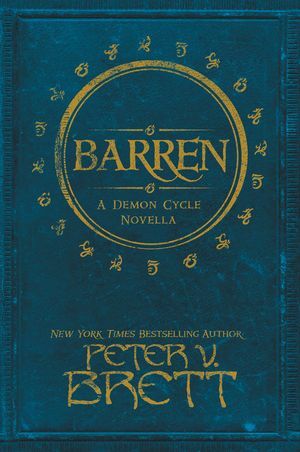 New York Times bestselling author Peter V. Brett returns to his groundbreaking Demon Cycle series with this enthralling novella—the latest story set in his much-loved fantasy world. Each night, the world is overrun by bloodthirsty demons. For centuries, humanity survived only by hiding behind defensive wards—magical symbols with the power to repel the demons. Now, the rediscovery of long-forgotten combat wards has given them the magic they need to fight back. In Tibbet’s Brook, the fighting wards have brought change, but the factions and grudges of a troubled past remain. Selia Square, the woman they call Barren, has long been the force that holds the Brook together. As a terrifying new threat emerges, she rallies her people once again. But Selia has a past of her own. And in a small community the personal and the political can never be divided. If Tibbet’s Brook is to survive, Selia must uncover memories she has buried deep—the woman she once was, the woman she once loved—and retell their story.